The below post contains affiliate links. Welcome to the Meaningful Holiday Home Tour hosted by the lovely Laura from Meaningful Spaces! 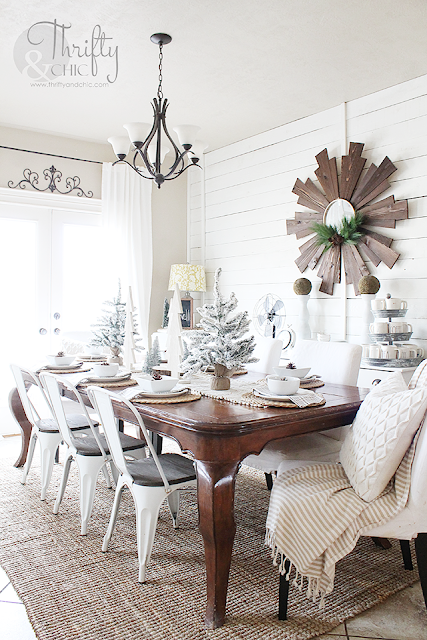 If you are new here and coming from Rachel's blog Rachel Elizabeth Creates, welcome! 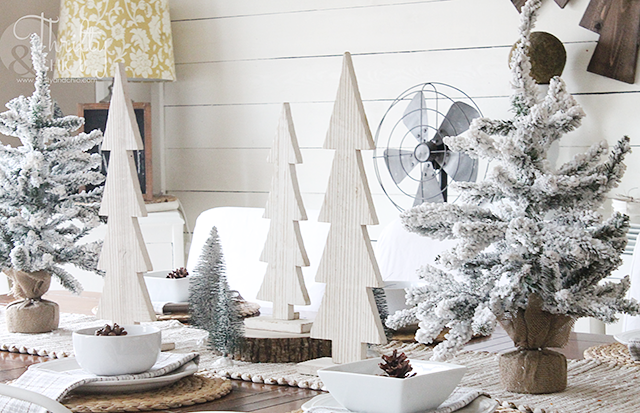 And if you aren't, still welcome :) Throughout today and the next few days, 11 other wonderful bloggers will be sharing their Christmas tours with you, so be sure to check them all out at the end of this post for more decorating inspiration! 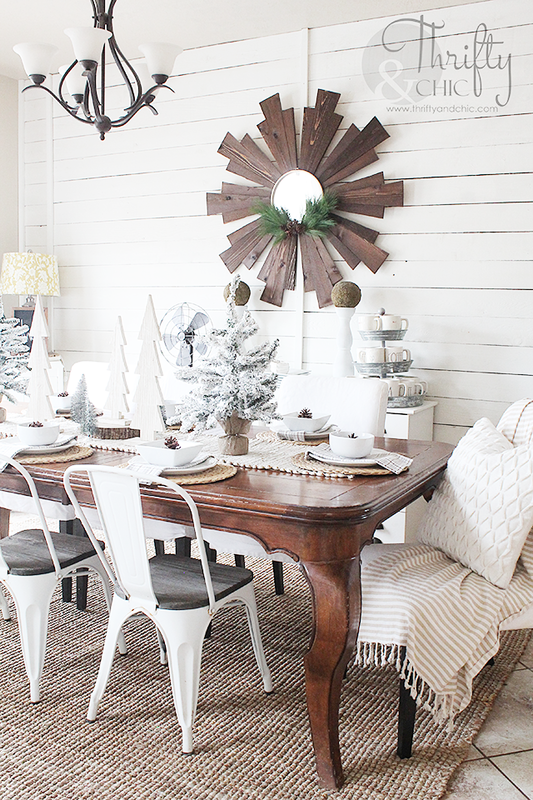 Last week, I shared my front living room with you all, and today I'll be sharing my dining room. 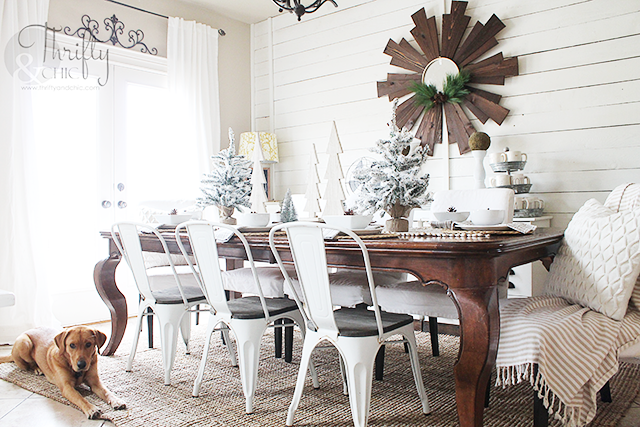 Our dining room is the heart of our home where almost everything happens. 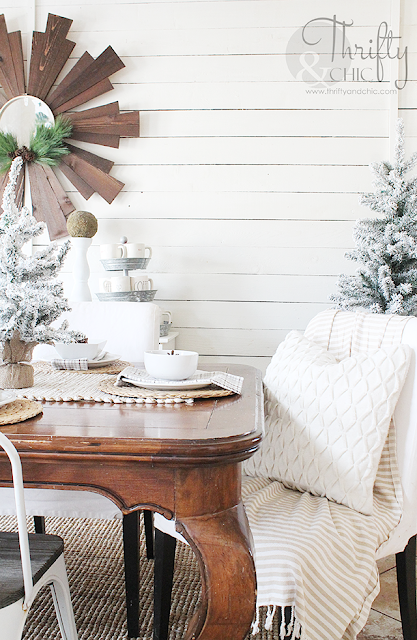 And besides that, it's also one of my favorite rooms in my house :) This year for Christmas, I went with a completely neutral theme in here. We have absolutely no snow yet, and it's kind of weird truthfully. 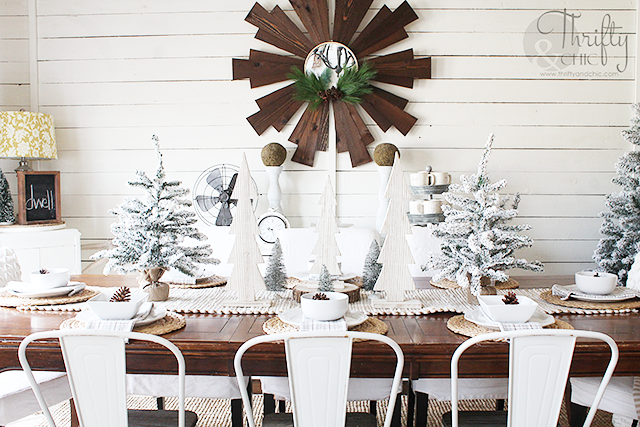 So, I decided to make my house a winter wonderland and use almost all white with the decor in about every room. So, without further ado, enjoy! 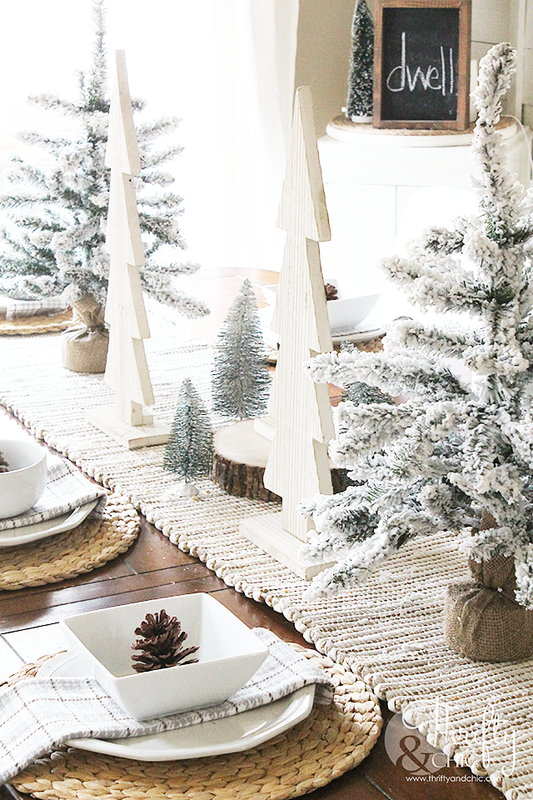 For the tablescape, I went with a winter-y forest, using 3 different types of trees. I added a little sliced wood piece to bring in more of the feel and texture. For the table settings, I simply placed a plate and alternating bowls onto jute chargers. I then finished it off with handmade flannel napkins and a pine cone in the bowl. 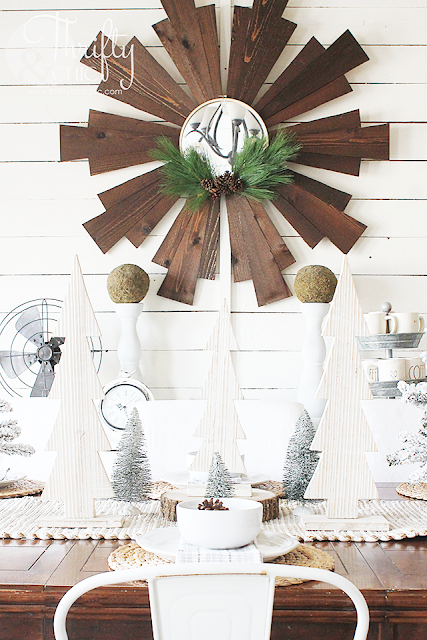 Come entertaining time, the pine cones will hold someones name on a simple card. And because he's in like half of my pictures, I figure I'll add him into the tour. This pup is getting so big! I can't wait for him to figure out what Christmas and stockings are all about! Be sure to check out the rest of today's tours. The tours start again tomorrow with Pink Peppermint Designs! Alicia I love your dining room! It's so fresh and pretty, and I can't believe how big your puppy is now! He's the perfect model. 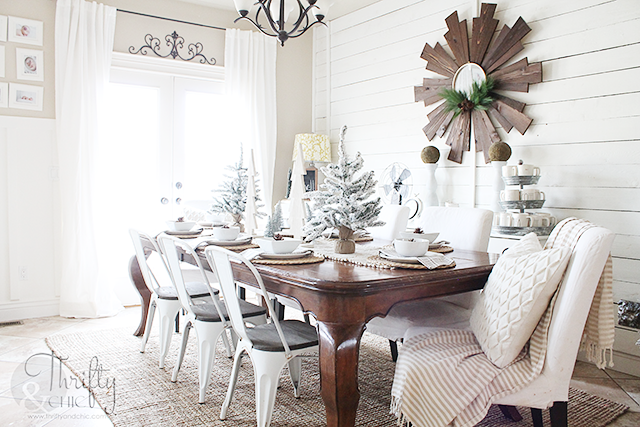 Such a pretty and fresh dining room! 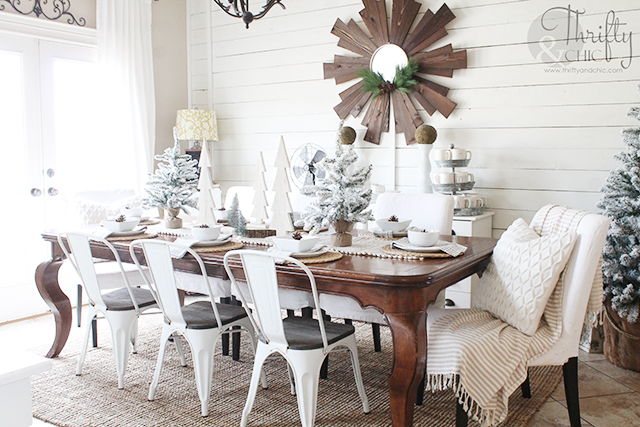 Looks perfect for the holidays!